Madrid is not known as a romantic city because cities are not romantic; people are. And the people from Madrid are definitely romantic, but they express it in different ways. Some people consider flowers, chocolates or an expensive dinner in a fancy restaurant as romantic. But in Madrid the beer, the squid sandwich and the crowded streets of the centre of the city can be sweet and romantic too. People in Madrid know for a fact that sharing a great sandwich with a jug of ice cold beer would melt the heart of the iciest person. The El Capricho Park is located in Alameda de Osuna, in the surrounding area of Madrid, it´s one of the most beautiful parks in the city and, surprisingly, it´s still a great unknown. This 14-hectare garden was built in 1784 when the Dukes of Osuna acquired this estate to give free rein to their artistic interests. They wanted to create an authentic garden of Eden and they succeeded, since it was frequently visited by very distinguished personalities. At that time you could find some of the most important artists, gardeners and scenographers of the time through its green gardens. Today we can admire its serpentine estuary with lake and island, the jetty or “cane house”, the temple of Bacchus, the “house of the old woman”, the fortress, the hermitage, or the “bee-eater “among some of other wonders that this garden hides for all tourists and locals, especially if you are looking for a magical experience in a romantic place for couples in Madrid. The roof of the Círculo de Bellas Artes (CBA) has one of the best views of Madrid, and offers its visitors an unparalleled perspective of the urban landscape of the city. To access the roof, the CBA has a lift with glass doors on the top floor, which from the lobby allows direct access to this privileged space. Tickets can be purchased at the reception of the building. The building is crowned by the Minerva sculpture, a work by Juan Luis Vassallo. It´s a bronze piece that represents the Roman goddess of wisdom, emblem of the Circle since its foundation. The rooftop gives us the chance to contemplate Madrid in a panoramic way, from La Sierra de Guadarrama, up North, to El Cerro de los Ángeles, to the South. The Madrid Golden Mile is a luxurious street located in the Barrio de Salamanca, a neighborhood in the center of Madrid. It´s one of the more expensive districts in the whole city, something you can feel in its elegant sidewalks and the fancy people you find walking down the streets or having coffee in its deluxe cafeterias. In the sumptuous avenues of the Golden Mile you can find jewelry stores, shoe stores, clothing stores and accessories, all of them being exclusive brands. If you walk through the Serrano, Ortega y Gasset, Velázquez, Lagasca, Ayala and Claudio Coello streets, you will find prestigious national and international firms. In the Barrio of Salamanca you will also find antique shops and art galleries that will make your shopping day perfect. The Royal Botanic Garden was founded more than 250 years ago, thanks to the romanticism interest in nature. It was nourished in the 19th century by the scientific expeditions sponsored by the Crown that wanted to increase the knowledge of the natural world. The Botanic Garden is a place to enjoy nature and calm in the heart of Madrid, and has beautiful surprises, such as the aromatic rose garden, the centenary trees, the Bonsai collection and the greenhouse. Taking your loved one to the Royal Botanic Garden is a must if you want to melt their heart. This beautiful place is full of romantic-era terraces, exotic trees and flowers. You can complete this romantic tour through the park visiting the enormous and beautiful walk of the olives. 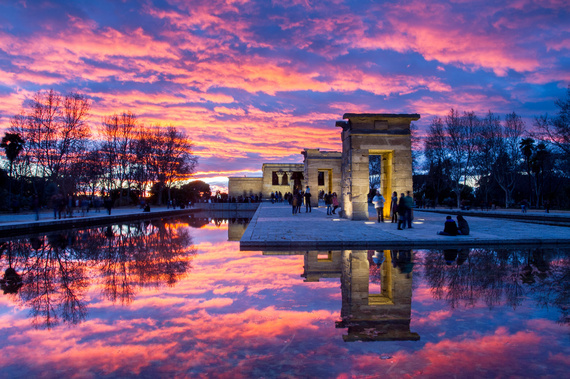 The Temple of Debod is an incredible and poetic space and a perfect place to enjoy a wonderful sunset. This authentic Egyptian temple was donated by Egypt in 1968 after Spain helped save the temples of Abu Simbel with the construction of the Great Dam of Aswan, a project in which many countries participated and was coordinated by UNESCO. The temple arrived in 1970 to Valencia, then moved to Madrid to begin with its reconstruction, and finally opened to the public in 1972. The sunset from this magical and historic place is impressive, many locals and tourists who come just at that time of day to contemplate not only the monument but the views. A fantastic spot to end your romantic journey in Madrid! Gran Vía is one of the main streets of Madrid. It crosses the city centre through some very notorious landmarks: Cibeles, Callao or Plaza España. But this street is also known as “El Broadway Madrileño” (The Madrid Broadway). Why? Because the street contains the most important theatres in the whole country. Walking through Gran Vía’s sidewalk you find legendary theatres like Rialto, Capitol or Lope de Vega, stages for classic and modern plays, specially musicals. The Spanish-language versions of famous musicals like “Grease”, “Madame Butterfly” or “Mamma Mia” have been played in this music halls for years. Today there´s been a significant drop in the audience, nevertheless this part of the Gran via is still a main place for music and theatre, and walking through its colorful lights, harmonious sounds and rambunctious vibe, especially at night, will make you feel like a musical star! The perfect time to spend with your loved-one and ending Madrid´s most romantic tour!